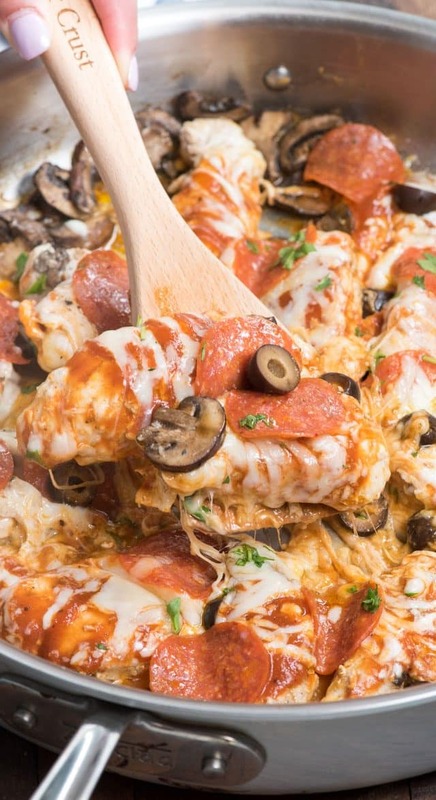 This EASY Skillet Pizza Chicken tastes just like pizza without the crust. Top chicken tenders with pizza toppings for an easy low-carb dinner. Use your favorite toppings to personalize this 30 minute chicken recipe! 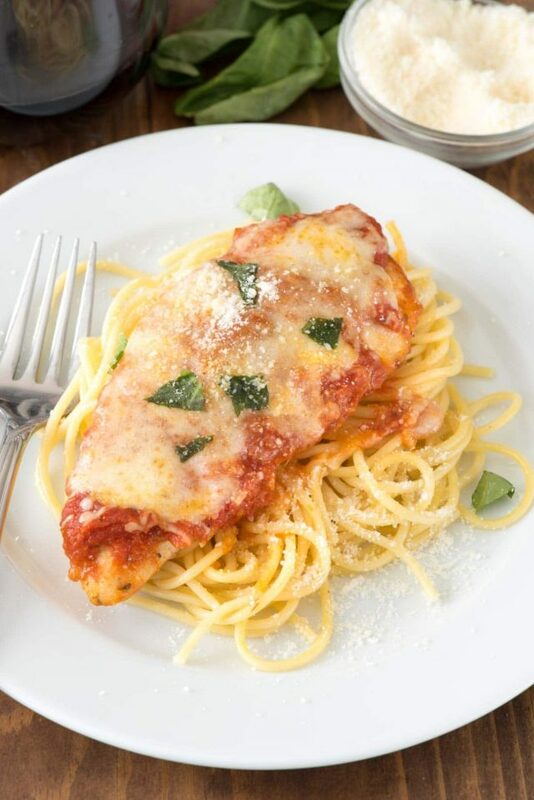 Easy pizza chicken like this is the perfect weeknight meal! I have to tell you guys – this is probably the BEST CHICKEN RECIPE I’ve ever made or eaten. It tasted JUST LIKE Pizza, but without the crust. Basically, it’s pizza with a chicken crust which makes it low-carb and perfect for those of you who are craving pizza but don’t want to blow your diet on bread. In fact, right now, as I write this, my mouth is watering. I think I need to take more chicken breasts out of the freezer to make this for dinner tonight. 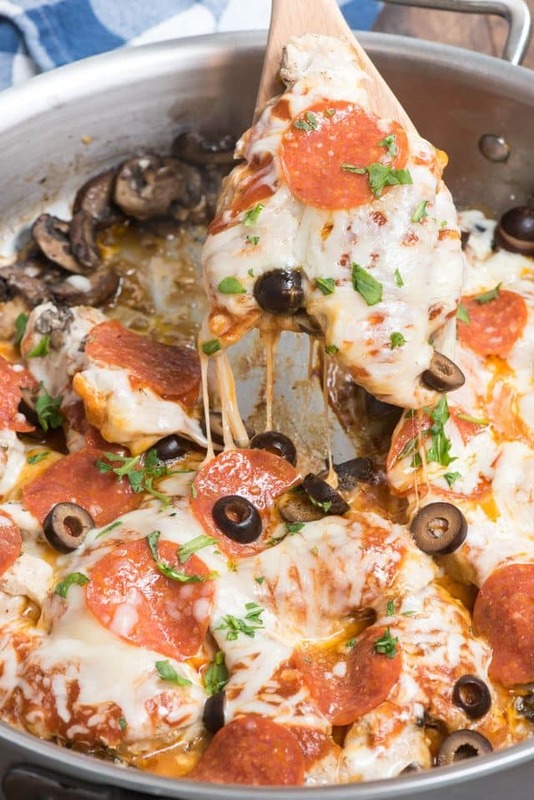 Cheesy Pizza Chicken is made in a skillet on the stovetop. It’s super tasty and made with all your favorite pizza toppings. Really, you can top it with whatever you want – what are your favorites? I used mushrooms, olives, and pepperoni. I love the combination of those flavors but you could easily use sausage, or add onions or peppers…or even ham and pineapple. Hawaiian Pizza Chicken…hmmm…that might be one I have to make too! You all know I’m trying to eat less carbs and sugar. In fact, I’ve been doing really well. Except for one bite tastes here or there of desserts I post to make sure they are edible and as drool-worthy as you expect, I’ve pretty much given up dessert and most bread and pasta. My only guilty pleasure is still wine. I’m not giving that up…really I mean life needs to be fun, right? Because I’m still getting use to the whole lower carb lifestyle, I’m still allowing myself things like cheese and the occasional salami or pepperoni. I have to take baby steps or I’ll totally fail, you know? If I give up everything all at once I’ll surely cave. Plus, it’s easier to not eat bread with lunch if I let myself eat a string cheese or spoonful of peanut butter. That’s why, even thought this Skillet Pizza Chicken recipe isn’t exactly low calorie, it’s low carb and it’s my favorite new go-to chicken recipe. When I first tasted it I swear I thought I was eating pizza. Skillet Pizza Chicken is a one pot chicken recipe perfect for a weeknight meal. It’s done in under 30 minutes! How do you make skillet pizza chicken? I started this recipe with chicken breast tenders. Sometimes I buy those if I’m at Costco or if they’re on sale, because I hate cooking full chicken breasts and I hate cutting up chicken. I like eating it, but I have a big problem touching it raw, so tenders are my way of getting around that. You can definitely use chicken breasts, but I suggest cutting them into tenders-sized pieces so this will cook faster. Tenders are perfect for weeknight cooking because they cook up fast. Since I decided to use mushrooms, I started off by sautéing them in my skillet. I’m using a large skillet here (it’s about 12-inches), so all the chicken will fit. Once the mushrooms started to cook I added garlic and then my chicken tenders, which I’d seasoned with salt and pepper and some pizza spices like oregano and red pepper flakes. Chicken breast tenders cook up rather fast, so once they’re almost done you add your pizza sauce to let them finish cooking simmering in the sauce (it helps them stay moist too) and then top with cheese and the rest of your toppings. Cover the pan to melt the cheese and you have the perfect dinner recipe in under 30 minutes! I absolutely love this recipe, seriously. I’ve been seriously dreaming about it since I first made it. Be sure to add it to your chicken dinner rotation! Use whatever toppings you like. You can skip the mushrooms and just start by searing the chicken tenders with garlic. If you want to use bell peppers and/or onions, I’d add them with the mushrooms at the beginning, to cook them a bit. Make this lower calorie by using less cheese and skipping the pepperoni. Be sure to use my homemade pizza sauce for even more flavor! Serving suggestion: a nice big salad! 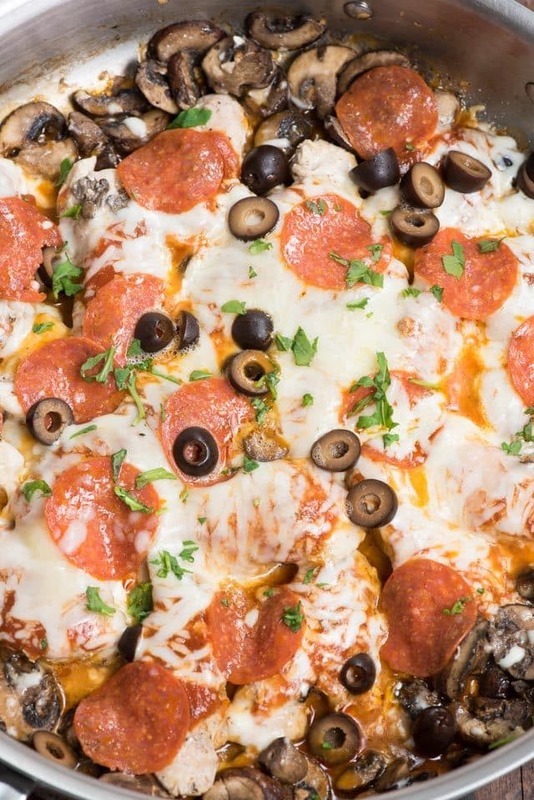 This EASY Skillet Pizza Chicken tastes just like pizza without the crust. Top chicken tenders with pizza toppings for an easy low-carb dinner. Heat oil in a large skillet over medium-high heat. Add mushrooms and cook just about 2 minutes, then add garlic and cook, stirring, 1 minute more. Meanwhile, sprinkle the chicken with the salt, pepper, oregano, and pepper flakes. Push the mushrooms to the edges of the pan. Place chicken tenders in the center of the pan. Cook about 3-4 minutes, or until golden, then flip and do the same on the other side. Add the pizza sauce to the pan. Cover and cook until the chicken is almost cooked through. Add the cheese, pepperoni, and olives and cover and cook until cheese is melted and chicken is cooked through. Be sure to try Holly’s Pizza Pasta Salad, Meagan’s Pizza Toast, and Erin’s Pizza Tater Tot Casserole! 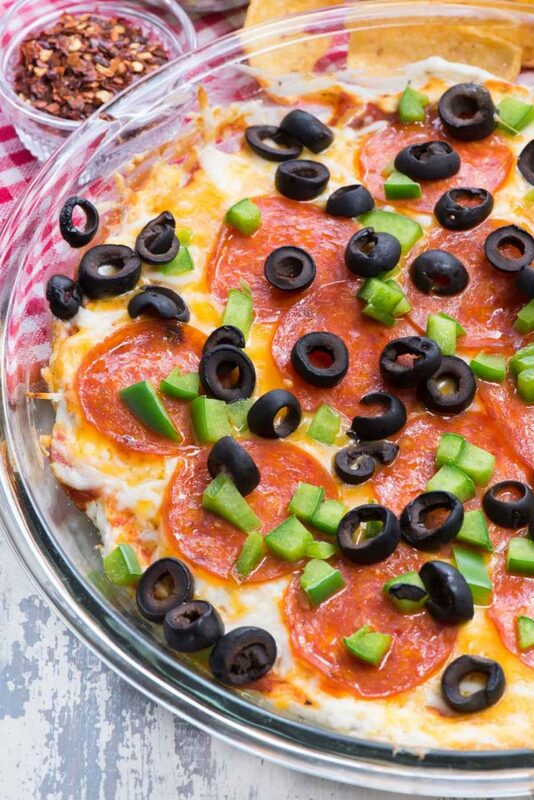 Pizza Dip is another low-carb pizza recipe! 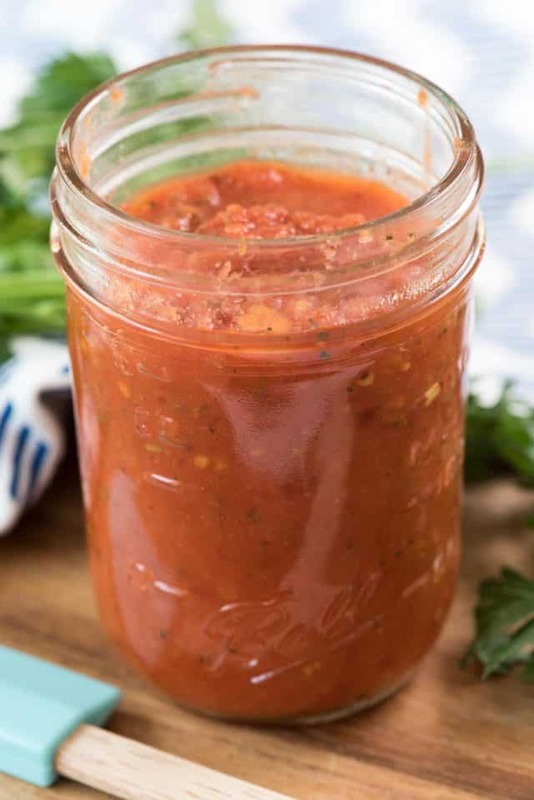 Homemade pizza sauce is perfect in this recipe! The fact that this is the best chicken recipe you’ve ever eaten or made is super super high praise and noteworthy! Also noteworthy is that you’ve pretty much given up desserts and are fully embracing the low carb lifestyle! Is this a crustless pizza???? You don’t say and there is no mention of a crust. Yet one of the pictures looks like there is a crust. How do you eat it? It’s chicken with sauce and cheese – I am going to eat it with my mouth! We love this easy recipe!